Available in well over 40 configurations, the 3I Series of waterproof cases are the perfect solution for storing and transporting your delicate electronics, A/V equipment, microphones, mixers, cables, computers or percussion and music accessories. Most sizes are available with a variety of interiors to accommodate the needs of the traveling musician. Interior options on most models include cubed foam, layered foam, padded dividers, or an empty interior. 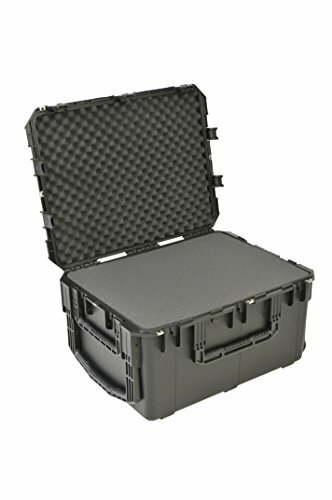 3I Series injection molded waterproof cases are constructed of ultra high-strength polypropylene copolymer resin and feature a gasketed, waterproof and airtight, submersible design (IP67) that is resistant to corrosion and impact damage. Its continuous molded-in hinge, patented "trigger release" latch system, comfortable, snap-down rubber over-molded cushion grip handle, secure stacking, and automatic ambient pressure equalization valve (MIL-STD-648C) all contribute to its military grade design.